Two transects at each of three sites were harvested for aboveground biomass, where transect 108 and 109 are from the unburned control site, 101 and 114 are from the severely burned site and 103 and 104 are from the moderately burned site. Quadrats measuring 10 x 40 cm were harvested every 5 meters over 50 meter transects for a total of 20 quadrats per site. Aboveground biomass is considered "within" the quadrat if it is associated with a meristem that is within the quadrat. Briefly, harvest method were as follows: the rhizome-containing soil layer was harvested by cutting around each quadrat boundary with a serrated bread knife. All aboveground live vascular plant biomass, and all live rhizomes and belowground stems within the quadrat boundaries, were separated by species. Current-year’s growth from meristems located within the quadrat was included in the sample even if that growth extended outside the quadrat. New growth from meristems located outside, but that extended into the quadrat, was not included in the sample. For older stems that crossed the boundary, only the portion within the quadrat boundaries was included. Biomass produced in the current year by each vascular plant was separated into leaves, new aboveground stems, and inflorescences with their peduncles, except that new growth from rhizomes was included with previous years’ growth. Older biomass was separated into belowground stems and rhizomes, aboveground stems, and (for evergreens only) old leaves. All graminoid, forb, and deciduous shrub leaves were considered to be new biomass. Belowground stems were separated from aboveground old stems at the position of the first adventitious roots. Vascular plant litter and attached dead biomass were saved, but not separated by species. These biomass harvest methods are consistent with our previous and ongoing LTER studies and thus allow direct comparisons. Lichens, mosses (green portions only), and liverworts (Marchantia polymorpha from burned sites) were not separated into species or new and old growth. Green moss biomass has been estimated to consist of approximately 20% new growth in those species where old and new growth can be distinguished, but they are not the majority of moss species present in tussock tundra. 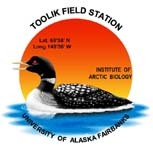 All plant samples were dried at 60oC for 72 hours and weighed to the nearest milligram at Toolik Field Station. Samples lighter than 0.004 g were weighed on a five-place scale in Woods Hole, MA. Samples were weighed in their bags unless they were lighter than 10 standard deviations of the average weight of the bag. We pooled material of each plant tissue type (excluding roots) and species from all quadrats from a given transect into blocks where quadrats 1-5 and 6-10 for each transect were lumped, resulting in four blocks per sample site. Blocked samples were ground in a Wiley mill with a 40 mm sieve and analyzed for C and N content by a Thermo Scientific Flash 2000 NC Soil Analyzer (Thermo Fisher Scientific, Cambridge, UK). C and N pools in biomass and NPP were calculated by multiplying the biomass of each plant species and tissue component by the appropriate concentration of C or N (from the pooled sample), and then summing over all species and tissues for each growth form in each quadrat. Bret-Harte, M.S., Mack, M.C., Shaver, G.R., Huebner, D.C., Johnston, M., Johica, C.A., Pizano, M.C., Reiskind, J.A. (2013) The response of arctic vegetation and soils following the Anaktuvuk River fire of 2007. Proceedings of the Royal Society B: Biological Sciences. 2013 ;368:1624. Shaver GR, Chapin FS, III. Production: biomass relationships and element cycling in contrasting arctic vegetation types. Ecological Monographs. 1991; 61(1):1-31. Bret-Harte MS, Mack MC, Goldsmith GR, Sloan D, DeMarco J, Shaver GR, et al. Plant functional types do not predict biomass responses to removal and fertilization in Alaskan tussock tundra. Journal of Ecology. 2008; 96:713-26. Zeros/Dots: If no sample of a tissue type was present in the biomass data, zeros were used. Where calculations were not possible dots were used as place holders. Taxonomic nomenclature: scientific names reflect historic names in conformity with other documents on this site. Note that Ledum palustre is now currently known as Rhododendron tomentosum, Saxifrage nelsoniana is now known as Micranthes nelsoniana (information from the Integrated Taxonomic Information System (itis.gov)). Definition: Oven dried weight of sample collected in a quadrat.